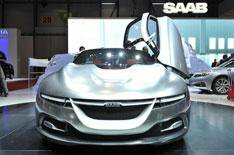 Phoenix to help Saab rise again | What Car? Its tempting to look at the Saab Phoenix concept car at Geneva and see a cynical attempt to grab a few headlines with a model that hasnt a prayer of making it into production. The truth is that it has much more relevance than first appears, says Saab boss Jan-Ake Jonsson. The architecture it is based around will not only form the platform for the next 9-3 range - which will start to emerge in 2012 - but looking much further ahead it will also be used for a new 9-5 family later this decade and an eventual replacement for the 9-4X SUV. Jonsson insists that the new architecture is essential to Saabs independence (it was sold by General Motors just over a year ago) and, although expensive, will ultimately save money. 'We will be able to use the same powertrains in all our vehicles and build them in the same plant (Trollhattan in Sweden), so there are lots of benefits,' he said. Nevertheless, a rival for Audis A1 remains 'top of the wish list', Jonsson admits. 'It is a very suitable segment for Saab to be in a car that is small, practical and with high performance. BMW, which is developing new front-drive architecture for the next Mini and a new family of small BMWs, is believed to be Saabs preferred partner.